If you have incorporated basic push ups into your fitness routine for some time, you have likely improved your body posture and strength. While you can continue to challenge yourself by performing more repetitions of the exact same exercise, it may be more beneficial to modify the push up to make progress and keep your workouts exciting. 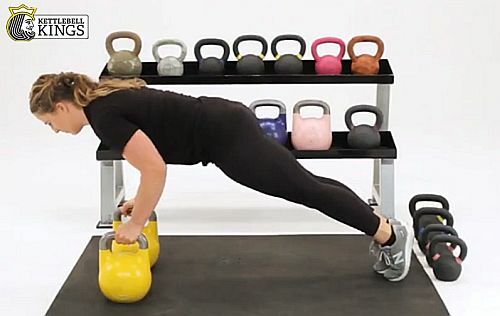 The kettlebell push up is a variation of the traditional pushup that offers an increased challenge due to the increase in range of motion you can achieve. The kettlebell pushup is a compound exercise that engages chest, core, pectoral, and leg muscles, and will help you enhance posture and progress to more challenging variations of the pushup. If you are ready to introduce kettlebells to your upper body workout routine, begin by practicing its pushup using two medium-weight kettlebells. Start by getting in the pushup position, holding it with each hand directly under the shoulders. Bend your elbows and lower your body down to the lowest range of motion that you can push back up from without losing your strong plank position. Push through the palms to drive back up to the top. Mastering the basic kettlebell pushup will help you progress though its variations, such as the single kettlebell pushup and the plyometric kettlebell pushup. To perform the single kettlebell pushup, get into a plank position with your arms shoulder-width apart, and your toes on the floor. One hand will be on the floor and the other will be on the kettlebell handle. Lower yourself down to the lowest range of motion that you can push back up from without losing your strong plank position. Then push back up by driving through your palms. Maintain a straight back and tight abs throughout the movement. The plyometric kettlebell pushup is another variation that is performed just like the single arm kettlebell pushup, but with a modification at the bottom of the movement. After lowering your torso down, push back up with most of the weight on the palm that is not holding the kettlebell. As you push back up explosively, bring your torso up and over the kettlebell so you can grab onto its handle with the opposite hand. Repeat going back in the other direction. This kettlebell pushup variation will develop explosive power for the upper body. Performing an intense workout that includes the kettlebell pushup or its variations several times a week will increase your VO2 max, or maximal oxygen uptake, thereby improving your aerobic fitness. Ready to reap the benefits of the kettlebell pushup? Be sure to warm up for 10-15 minutes with easy cardio and dynamic mobility exercises. Once you are warmed up, try the aerobic workout below, which includes the kettlebell pushup. Start with the kettlebell in front of the feet. Hinge forward and grab hold of the handle with one hand. The hips should be at or below shoulder level. Set your back by pulling the shoulder down and away from the ear. Tip the bell back as you sink your weight back into the hips and hamstrings. Hike the bell back between your legs, keeping shoulders over the toes. Hips should remain at or below shoulder level. You should feel a stretch in your hamstrings. The free arm mimics the working arm. Drive the feet into the floor and extend the hips; contracting the glutes and abs to maintain a straight line at the completion of your hip extension. The bell should “float” to the top position; the elbow should have a slight bend to allow for this. Allow gravity to bring the bell down toward your body, waiting for the arm to hit the waistband before you start to hinge back. Hinge into the backswing of the next repetition, keeping the knees back in order to maximally engage the hamstrings and glutes. Make sure the bell does not flip up in the backswing. Repeat the movement for 60 seconds, the switch hands and perform the swing on the opposite side. Start with a kettlebell in the rack position: hand fully inserted so that its handle is diagonal across the palm, elbow tucked into the body and kettlebell resting on the forearm and bicep. Sink down into a squat position, keeping the chest up and weight in the heels. The elbow can come off the body to support the weight of the kettlebell. Go as far down as your range of motion allows without tucking the tailbone under. As you drive up and out of your squat, allow the momentum generated by the legs to transfer to the kettlebell so that the bell starts to move up before the hips are fully extended. Finish by pressing the bell into the overhead position as your legs fully extend. Perform 8 repetitions before switching sides and performing 8 more. Start with feet about hip width apart and the kettlebell between the feet. Grab hold of the right side of the kettlebell handle with your right hand. Shoulders should be at hip level or above, with the back flat. The legs will remain bent throughout the movement. Swing the bell back behind the left leg, bringing the left arm back to grab hold of the left side of the its handle. Release the right arm and swing the bell around the left leg. Bring the bell through the legs and behind the right leg, reaching the right arm behind to grab the right side of the kettlebell handle. Release the left arm and swing the bell around the left leg, then begin another repetition. Perform 5 repetitions on both sides. Start with a single kettlebell in front of the feet. Hinge forward and grab hold of the kettlebell handle. The hips should be at or below shoulder level. Swing the bell back between your legs. Drive the feet into the floor and extend the hips; contracting the glutes and abs. As the bell reaches the “float” position, pull it toward you using the lats and shoulders. Insert the hand through the kettlebell handle just before the bell reaches the overhead position. In the overhead position, ensure the wrist is straight and the bell is stacked over the elbow and shoulder joints. Rotate the bell, flat bottom pointing out to unlock the bell from the overhead position. Keep the torso upright as the bell begins to drop. Wait until your arm hits your waistband before bending at the hips and following the bell down with your torso. Hinge into the backswing of the next repetition. Perform 8 reps, then switch sides and repeat. Start in pushup position, with one hand on the floor and the other holding the kettlebell handle. Lower yourself down as low as you can that you can push back up maintaining a strong plank position, then push back up. Perform 8 reps, then switch sides and perform 8 on the opposite side. Start with feet about hip width apart and a kettlebell between your feet. Bend forward and grab hold of its handle, maintaining a flat back and keeping the shoulders at or above hip level. Drive through the legs to straighten up, then pull the shoulder back and bend the elbow to keep it close to the body as it flies up. on the forearm and bicep. To drop the kettlebell, keep the torso upright as you flip the bell over the hand and allow it to fall down toward the floor. Return the bell to the starting position on the floor. Perform 8 repetitions, then switch sides and perform 8 more. 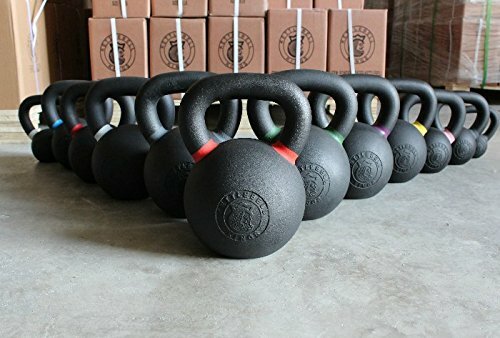 When performing exercises that require the kettlebell to support your bodyweight, such as the push up, you will notice that the weight wants to move and roll around since the kettlebell’s mass is not distributed evenly around its handle. Working to control itdespite its off-balance properties, itwill bringstability on your core muscles. Each repetition will require more balance, power, and strength than a typical push up, which in turn willdevelop your forearms, rotator cuffs, and shoulders.